Ideal for: all street theatre events, festivals, corporate entertainment, green and countryside events. The wildlife broadcast unit have arrived at your event to film another episode of 'Animal Crackers'. 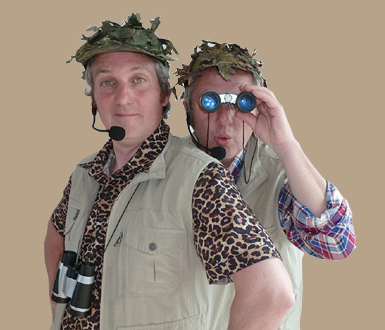 Discretely hidden from sight they let our two larger than life presenters track, observe and sometimes provoke the teeming wildlife at your event! Broadcasting live to the immediate area (through small amps worn as part of the costume), our two experts are bringing you a nature programme quite literally from the field. This is nature uncut. As the audience becomes the passing wildlife our intrepid presenters watch with fascination the migration patterns, mating rituals, feeding preferences and family lives of the animals. Sensitive and playful observational comedy and routines make this act highly popular with audiences encouraged to let out their inner animal!